RadCalendar for UWP provides MultiDayView mode which enables the end-user to have a detailed view of the schedule for a specific day (or days). You could visualize between 1 and 7 days at once on the DayView area. 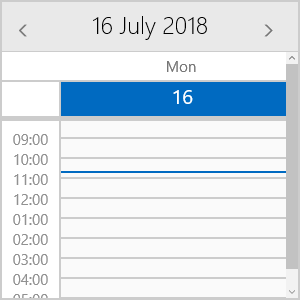 In order to enable it you need to set DisplayMode property of RadCalendar to “MultiDayView”. 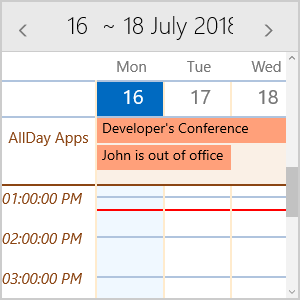 This section lists the key properties of MultiDayView you could use to set its time ruler and AllDayArea, so that the Calendar best suits your needs. 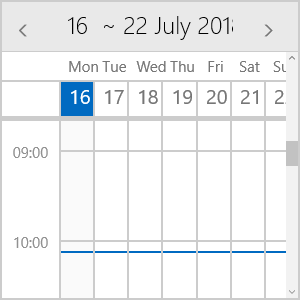 VisibleDays: Defines the number of days visualized on the DayView area. The default is 7 days. DayStartTime: Defines the time used to indicate the start of the time ruler. The default value of the DayStartTime is 00:00:00 or 12:00 AM. DayEndTime: Sets the time used to indicate the end of the time ruler. TimerRulerTickLength: This property is of type TimeSpan and defines the density of the time ruler items. TimeLinesSpacing: Defines the space between the lines on the DayView area in pixels. ShowCurrentTimeIndicator: Provides the option to visually mark the current time in the time ruler and across the view. By default, it is True. 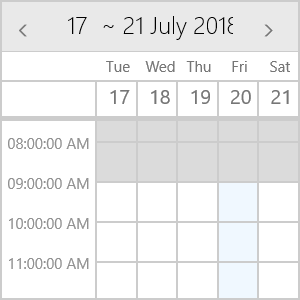 WeekendsVisible: Boolean property that will allow to exclude the weekends from the timeline, so that only the work week is displayed. ShowAllDayArea: Defines whether the AllDay area will be shown. AllDayAreaText: Specifies the Text shown inside TimeRuler next to the AllDay area. AllDayMaxVisibleRows: Specifies how may rows will be visible in AllDay area. AllDayAppointmentMinHeight: Sets the height of the appointments inside AllDay area. AllDayAppointmentSpacing: Defines the gap between appointments inside AllDay area. The last three properties define the overall height of the AllDay area. Using MultiDayView you can define special slots and apply different styles to them. You just need to prepare a collection of Slot objects and assign it to SpecialSlotsSource property of the MultiDayViewSettings. Additionally, by utilizing the SpecialSlotStyleSelector you could define different Styles according to a certain condition. The next screenshot demonstrates how the applied special slots styling will look. TimeRulerItemStyleSelector: StyleSelector used to apply the style of the horizontal and vertical lines as well as the TimeRuler labels. CurrentTimeIndicatorStyle: Sets the Style applied to CurrentTimeIndicator shown across the view to mark the current time. TodaySlotStyle: Defines the Style of the Slot that represents the current day. AllDayAreaBackground: This property is of type Brush and sets the background color of the AllDay area. AllDayAreaBorderStyle: Sets the Style of the Border wrapped around the AllDay area. AllDayAreaTextStyle: Defines the Style applied to AllDayAreaText.